The best muslim weddings we have come across so far! A Muslim wedding or Nikah, is celebrated with as much grandeur and elegance as any other Indian wedding. When we think about a Muslim bride, our mind starts imagining a beautiful woman with distinctive eye makeup, kohled eyes, wearing a royal sharara paired with a remarkable jhoomar/paasa. This muslim wedding has all the inspiration that you need, right from the stunning decor to the gorgeous bridal outfits. She kept the best one for the nikah. She wore a gorgeous red and gold Manish Malhotra lehenga. Check out all the details from this muslim wedding here. Her haldi and mehndi ceremonies were held at Kino Cottage in Versova. It’s a beach facing bungalow especially known for its sundowners, hence the function began at 4 in the afternoon and ended at night, post dinner. This Indian muslim marriage held at Jahanuma Palace was an event to behold. It was a regal muslim wedding where the bride looked truly like a mughal queen! Her mehndi decor was just phenomenal! Reham and Abaan, tied the knot in a beautiful destination muslim wedding at Chomu Palace, Jaipur! It goes without saying that their wedding had complete regal vibes. For her sangeet night, the bride opted to wear a pink number while, entering like a princess on a palanquin. This muslim marriage was all about sober colors. Abaan chose to wear a white base with maroon trimmings ! The best out of all her bridal outfits,, was her reception lehenga, where she decided to wear a heavy red lehenga with some gorgeous golden work on it ! This is the muslim marriage of two romantics. 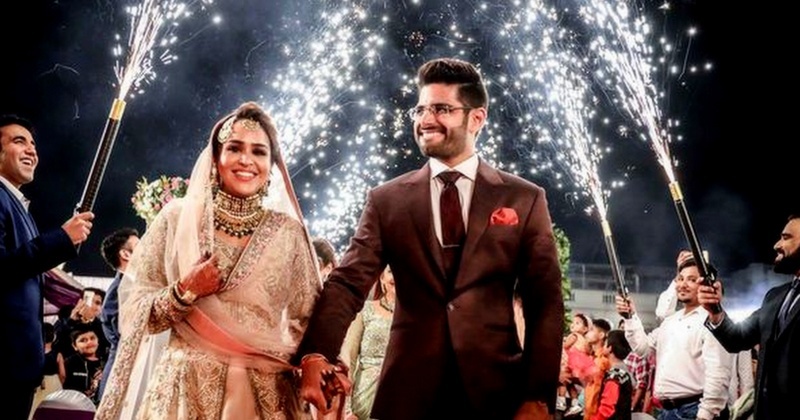 Yusra and Shuja knew each other for 6 months before they decided to tie the knot and just by the end of the 3rd month, they already knew they wanted to spend the rest of their lives together. They got married in a beautiful muslim wedding ceremony and it’s something that will give you major wedding goals. Amyna and Nooruddin had the most beautiful and laid back muslim wedding which really stole our hearts. They got hitched in the city of Little Rock, Arkansas. P.S. look out for Amyna's white and gold saree that is a vision of ethereal beauty. Saara and Sahil got married in a beautiful beach hindu - Muslim wedding in Goa and it was yet another sight to behold. Saara made a gorgeous muslim bride in an elaborate red lehenga with intricate and heavy gold embroidery by Shweta Gandotra. While the dapper groom decided to match all the grandeur of Saara’s outfit by wearing a royal gold sherwani with a red dupatta. The beachy vibes of the venue lent a laid-back mood to the event. This is one of the liveliest muslim wedding receptions we have come across where Pallavi and Zaheer kept it to a family-only event (including their cute dog). Image Source - Talking Pictures by Hitesh. What do you get when a gorgeous optometrist introvert says a long-awaited yes to her "Renaissance Hero," everyone says nacho sare jee padhke! This was a Hindu - Muslim wedding fueled with dhamal, masti and a ton of laughter. From an adventurous proposal in Dubai to to a Spanish themed brunch, an electrifying Sangeet and the most romantic Nikah, this muslim wedding is forever etched in reminiscence. The second day witnessed a Spanish themed brunch titled Viva La Fiesta. Ladies were welcomed with floral tiara and hats for men. The couple entered on a colorful tri-cycle and the bride was fanning herself like a true Spanish beauty. And after all the morning fiesta-ness, the evening Sangeet was full of power performances. A huge 40 feet stage with 1000 bulbs was created. A walkway with 10000 roses was produced to welcome one and all and a huge cutout of DANCE was displayed as a photo booth corner. Major Muslim wedding goals right?